By this time, I’m pretty sure you’ve figured out that my love for chocolate is unquestionable. Chocolate always has its way to my heart. This dark deliciousness that melts in your mouth, coating your tongue with luscious creaminess, before its sprinkle of magic dust somehow finds its way into your blood stream, to your heart, to your brain, and then to your soul. The beauty of chocolate is that you can enjoy it anytime of the day, in any condition or emotion. Hot, cold, happy, sad, liquid form, solid form, powder form, etc etc. The same goes with oatmeal. You can enjoy it both, hot or cold! In the coldest winter day or the hottest summer day. So today’s breakfast is a combination of two things I love. Chocolate. Oatmeal. Knowing that the combination of these two beauties is sitting in my fridge, I can’t wait for morning to come. Maybe if I close my eyes and go to sleep earlier, morning will come faster…. What makes this oatmeal so good? Chocolate – There is not a single doubt that chocolate is good for you! Mental-wise and health-wise. Number one. It gives you a massive euphoria and transports you to heaven. Two. It is an amazing source of antioxidant. And three. It has quite an impressive amount of nutrition. Oatmeal – We’ve all seen the ads on TV, magazines, maybe even radio, that oatmeal is high in fiber and helps in lowering your cholesterol levels. Recently, as I’ve been tracking down my macros, I found out that oats have a decent amount of protein. 7g in ½ cup of rolled oats! 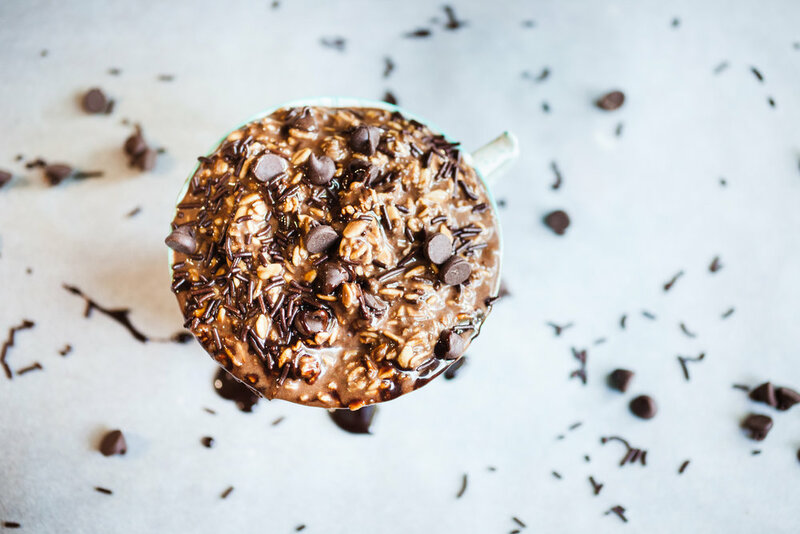 Chia Seeds – I love adding chia seeds to my oatmeal. Not only does it thicken it, it’s also a great source of protein and fiber and also omega-3. So easy to make – All you have to do is mix everything the night before and voila! A meal will be waiting for you in the morning. Drizzled with chocolate sauce and topped with chocolate sprinkles and chocolate chips. It’s a chocolate lover’s dream breakfast! The night before, mix your rolled oats and chia seeds in a bowl. In a shaker bottle, shake your almond milk, protein, cacao, and maca powders. Pour in the protein mixture into the chia-oats mixture and whisk. Refrigerate overnight. In the morning, enjoy your oats topped with your favorite toppings!